Take a behind-the-scenes peek at the work that goes into preparing skaters for a long, strenuous season, courtesy of the New York Islanders’ strength and conditioning coach. Excess body fat isn’t an issue for most players in the National Hockey League (NHL). If you’ve ever watched a professional ice hockey game, especially a multiple-overtime playoff game, you can probably guess why. It takes a lot of energy to repeatedly skate up and down the rink as fast as you can, and extra baggage for that trip can be more costly than what some airlines charge. Many casual or even dedicated fans may attribute such remarkable endurance merely to the superior athleticism of the players and, of course, some of the best athletes in the world play in the NHL. But no matter how talented an athlete may be, it takes a lot of behind-the-scenes work to get players ready for an 82-game schedule and, with any luck, a lengthy playoff run. Jesse Demers, CSCS, is the strength and conditioning coach for the New York Islanders hockey team. His job is twofold: help the players train their bodies to withstand the wear and tear of a very long season—81/2 months from the first day of training camp to the last game of the Stanley Cup finals—and ensure they have enough energy to put out their maximum effort every game. As with most professional sports, preparation for a new season begins almost immediately after the previous season ends. So what does that behind-the-scenes nutrition and training look like? Today’s Dietitian spoke with Demers to understand the approach he takes with the New York Islanders during the off-season and when it’s game time. At the end of a season, Demers meets with each player to review areas for possible improvement. The suggestions can range from trying a different mental approach to training differently. Some players may need to get bigger, while others may need to get faster. Demers keeps a training book that details his assessment of what the team needs, and he points out areas on which he would like each player to focus. After that, the players head into their off-season. They can work out at the team’s facilities if and when they like, but regardless of where players choose to train, Demers calls them weekly to check on their progress. These progress checks can be especially valuable for the Islanders’ young players. Even though players are free from practices and games during the off-season, they generally ramp up their weight-lifting and cardiovascular workouts as they attempt to get stronger for the new season. Demers provides expertise to help them achieve that goal. Rather than focus on training a particular muscle group, Demers advocates training groups of muscles depending on how they relate to movement. He uses four main groupings as his training basis: muscles that pull, muscles that push, leg muscles, and core muscles (muscles in the abdomen and lower back that stabilize the trunk). Within this format, he varies the specific exercises to work the muscles in different ways (a training concept known as muscle confusion), which helps them grow. Rotational power helps with hockey movements such as shooting and passing. Tread power helps the players get a better push on their skates, which improves overall speed, quickness for stopping and starting, and strength for maintaining position in front of the net. While Demers uses this basic structure year-round, there are fewer opportunities to lift during the season, which places added importance on the summer workouts. At the beginning of the summer, the weight-lifting volume—the number of sets and repetitions—is increased, which helps develop muscle endurance and prevent injuries. The players lift heavier weights in the middle of the summer to build strength. During the later part of the summer, they use less weight with quicker movements, which helps develop power. Demers uses these same principles in his cardiovascular workouts. But exercise is only one side of the coin. To achieve their desired results, the players need to fuel their bodies correctly. The off-season is a time to experiment with new foods and eating regimens. Demers provides a list of recommended foods for his players during the summer. He emphasizes whole, unprocessed foods that help the players meet their daily caloric and nutrient requirements. In addition to their performance benefits, whole foods help promote long-term health. Demers also tries to make the players aware that carbohydrates should be the main focus of their meals, with proteins and fats assuming a lesser role. Although the Islanders, like most NHL teams, don’t employ a staff dietitian, Demers does work with a dietitian on a consulting basis. By the time the preseason begins, the players are as big and strong as they’re going to be for the season. The focus then changes from muscle building to muscle maintenance. There’s less time for weight lifting, so the players lift after games when they don’t have to travel or play on back-to-back nights. They also lift when they have two days before the next game. To help players maintain strength and prevent injury, Demers uses the pregame warm-up as a sort of mini lifting session. For warm-ups, the players do body weight exercises or work on a physioball. But even though they’re no longer trying to add muscle, they’re still expending a tremendous amount of energy. Demers measures calorie expenditures by measuring the players’ metabolic heart rates. He starts by establishing a baseline for each player’s VO2 max—the amount of oxygen he can process—at four different work rates. Using these data, along with a player’s height, weight, and age, he can calculate the number of calories that player burns during a game. Depending on the player, calorie expenditures can range from 1,800 to 2,500 per game. In the preseason, Demers records the players’ weights before and after practice. During the season, the players weigh themselves every day, and Demers does it for them twice per week to check for discrepancies. Excessive weight loss during the season is a problem. If a player loses a significant amount of weight in a short amount of time, Demers lets the player know and gives him a day to stabilize his weight before reporting it to the coaching staff. By comparing the number of calories burned in a practice or a game and the amount of weight that’s lost, Demers can determine how much fluid the player lost. He says this has been extremely helpful for estimating caloric needs and keeping the players hydrated, which is a constant challenge. The amount of water and electrolytes that a player loses depends on his size, metabolism, and conditioning level. Proper hydration is crucial not only to prevent cramping but also to maintain muscle. Demers tells his players to drink before, during, and after practice as well as at home. Demers also encourages players who play more minutes of a game to drink a couple of carbohydrate drinks throughout the game or eat a little bit between periods, even if it’s just a couple of bites of an energy bar. Doing so can help maintain blood sugar levels and prevent a third-period crash. To help the players get enough calories, the team has daily breakfasts and postpractice lunches as well as pregame and postgame meals on the road. Demers recommends slow-burning complex carbohydrates, such as oatmeal, brown rice, corn, peas, root vegetables, beans, lentils, yams, and pasta, before games and fast-burning simple carbohydrates, such as biscuits, raisins, honey, sports drinks, and fruit juices, after games. He finds that he has to frequently reinforce this message with the players. In light of all the skating, some people may be surprised to learn that hockey relies much more on the body’s anaerobic system than its aerobic system. Demers estimates that the game is 83% to 89% anaerobic, with the remainder being aerobic. Because of the change in workload, the players also need to change the composition of their meals. Demers says players need a 4:1 carbohydrate-to-protein ratio to minimize muscle breakdown during the season, although players who play more minutes need to consume more total calories. On average, each minute of ice time requires a little less than 100 kcal, but players who are more active on the ice—whether from hitting more, skating more, or both—can burn more than that. Players who log 20 to 25 minutes per night can easily use the same number of calories in a game that an average person would need to get through an entire day. A player who plays that much may need 50 g of carbohydrates and 15 g of protein after a game for muscle maintenance and recovery, while a player who plays four or five minutes per game may only need 25 g of carbohydrates and 5 g of protein. So how do these differences play out on the ice? The star players will play the most, but players are always competing for ice time, and the ones who play less want to prove that they deserve more. For the training staff, it’s a constant balancing act. Proper nutrition is important for any athlete, but for a professional athlete, it could be the difference between making and missing a roster. As the sports nutrition field has evolved, many professional football and baseball teams have added dietitians to assist with this training aspect. Although RDs are relatively new to many NHL training staffs, some teams are taking a cue from other professional leagues and hiring dietitians to help their athletes get the most out of their bodies. While dietitians are employed by virtually every National Football League team and many Major League Baseball teams, their ranks are somewhat smaller in the NHL. 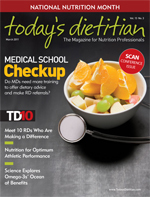 It’s not that teams don’t recognize the importance of proper nutrition; it’s that they may not have considered how a dietitian can help beyond the basics, says Kimberli Pike, MS, RD, CSSD, director of the didactic program in dietetics at Ball State University. Pike, who has worked on a consulting basis with NHL players, junior leagues, farm teams, colleges, and USA hockey for 12 years, was the Flyers’ team dietitian from 2006 to 2010. She says demonstrating the value of an RD can open a lot of doors. Pike says dealing with player injuries is a big part of what she does. In hockey, concussions are a constant risk, and broken jaws are not uncommon. To help treat those injuries, she draws on what she learned from clinical dietetics, sometimes using enteral supplements that have essential amino acids as additions to the prescribed diets she recommends for nutrition and healing. She adds that concussions can sometimes interrupt sleep/wake cycles, and food can be used to help normalize sleeping patterns. And as much as strength and conditioning coaches may know about nutrition, the field is constantly changing. Most strength coaches probably don’t have time to stay on top of every new development. Having someone on hand to specifically think about how nutrition relates to performance can be helpful. Jenna Stranzl, RD, CISSN, the Flyers’ current dietitian, says RDs can dig a little deeper to provide an athlete and his organization with information that can create a competitive edge. Sometimes changes in routine can make a big difference as well. When she started as the Dallas Stars’ dietitian last May, Amy Goodson, MS, RD, CSSD, LD, noticed that the players frequently eat on planes. She also noticed that postgame airplane meals were often takeout orders from places such as The Cheesecake Factory. This didn’t seem like such a good idea to her, and when the team decided to change its charter service, she suggested they change the meal service as well. Dietitians can also help players from outside North America and young players adjust to eating in a way that supports athletic performance. The NHL has players from many European countries, and finding nutritious food in a place where they don’t speak the language can be a challenge for them. As for players coming from junior hockey and college, Pike says many have never had to buy groceries or cook for themselves, and they need to be taught how to do it. But even at the professional level, players still have dietary questions that they need answered. The trick is getting them to ask. Professional athletes tend to avoid revealing personal details to people they don’t know well, and they may be reluctant at first to discuss how many nights per week they go out or admit to an excessive fondness for Red Bull. It takes time to develop a rapport, and just being available on a regular basis can help the players feel more comfortable. So will there be more NHL opportunities for dietitians in the future? Luce thinks so because he believes diet will play an increasingly important role in hockey training. And the field is far from full. Pike and Goodson are the first staff dietitians their teams ever hired, and Stranzl worked in other sports as well as collegiate hockey before the Flyers hired her. But all three RDs agree that the best way to break into hockey—or any sport for that matter—is to develop relationships with the strength and conditioning coaches because they’re likely to know about any job openings for dietitians and, more importantly, they can be a crucial bridge between RDs and players. If an opportunity arises, study the organization and see how it’s run. Goodson says the goal is to develop a culture that supports nutrition. But it’s best to begin with small steps; most organizations aren’t receptive to sudden, wholesale changes.